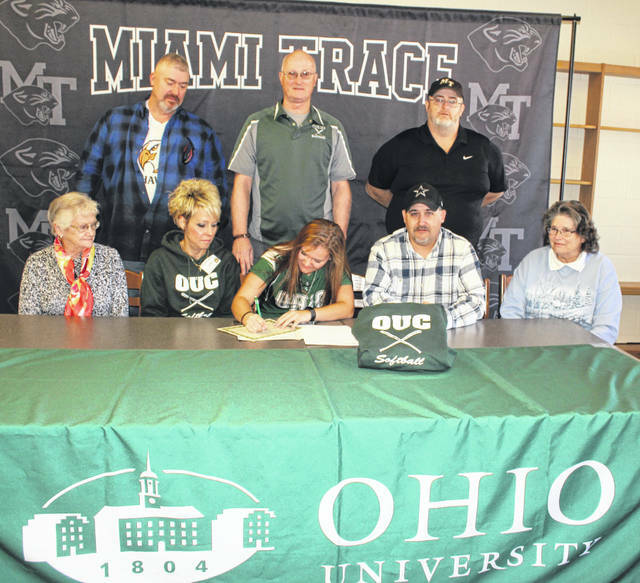 Miami Trace senior Breanna Eick, seated, middle, signs a letter of intent to attend Ohio University-Chillicothe where she will continue her education and her softball career. She was joined for the occasion by family members, coaches and teammates in the Miami Trace High School library. (front, l-r); Joy Altiers, great-grandmother; Susan Henry, mom; Eick, her dad, Chuck Eick and her grandmother, Sandy Adkins; (back, l-r); Tim Adams, travel coach for the Ohio Hawks; George Beck, Ohio University-Chillicothe softball coach and Joe Henry, Miami Trace softball coach. 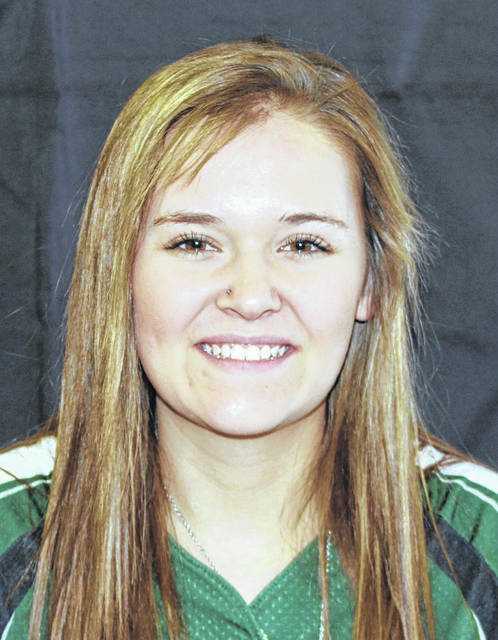 Breanna Eick, a senior at Miami Trace High School, signed on Jan. 25 a letter of intent to attend Ohio University-Chillicothe, where she will further her education and play softball for the Hilltoppers. Eick is in her first year at Miami Trace, having previously attended Piketon High School. She is the fourth member of the Lady Panthers softball program to announce that she will play softball in college, following announcements from Olivia Wolffe (Cedarville), Jessica Camp (Capital) and Kaylee Hauck (Wilmington College). “The past three years I played for Piketon as their shortstop,” Eick said. Eick said that her family has a background in racing, dirt racing, go-carts, late models. “I was really big into that,” Eick said. “Then, my best friend, Julia, and I got these papers for little league softball and we decided to try something new. We ended up trying it and I just fell in love with the game. In the relatively short time she’s been at Miami Trace, she has at least three favorite teachers: Amy Streitenberger (English), Valerie Hawvermale (English) and Christie Wilt (Credit Flex Program). English and yearbook are two of her favorite things at Miami Trace. As far as a course of study in college, Eick said that she is looking at child development. “I’m leaning more towards the teaching career in child development or social work,” Eick said. “She’s a pretty good pitcher,” Miami Trace head coach Joe Henry said. “Shortstop, second base — she can play about anyplace on the infield. She’s very fast. She’s a good athlete. She bats both ways. “It’s not easy to find a (college) team if you are a high school softball player,” OU-C head coach George Beck said. “In the United States, there are about 14,000 high schools that have softball programs. For colleges, there are about 1,200 to 1,400, in that range. From year to year it varies. So, it’s not easy to find a team; it’s a challenge. “I saw Breanna in travel ball and a little bit in high school,” Beck said. “I really noticed what she did in travel ball last year, running the bases, making delayed steals. She’s a versatile player who pitches and plays multiple positions. It’s always good to have a kid that can pitch a little bit. She’s not projected to be a starting pitcher for me, but she’s someone who can go in and throw an inning or two when you need them.